When the album ‘Labyrinth Constellation’ came out in the early months of 2014, it took the death metal world by surprise and established Long Island, New York group Artificial Brain as one to be reckoned with. By artfully combining elements of old and new-school death metal, dissonant avant-garde style riffs, and trace elements of black metal, Artificial Brain were able to create a musical canvas which made them stand out from the legions of up and coming extreme metal bands, yet place them in the same league with greats such as Ulcerate, Deathspell Omega and Gorguts. With the bar having been set so high for a debut release, fans were eager to hear what the band had to offer for their sophomore album ‘Infrared Horizon’ — which was once again produced by Colin Marston (Gorguts, Dysrythmia, Krallice) at The Thousand Caves. 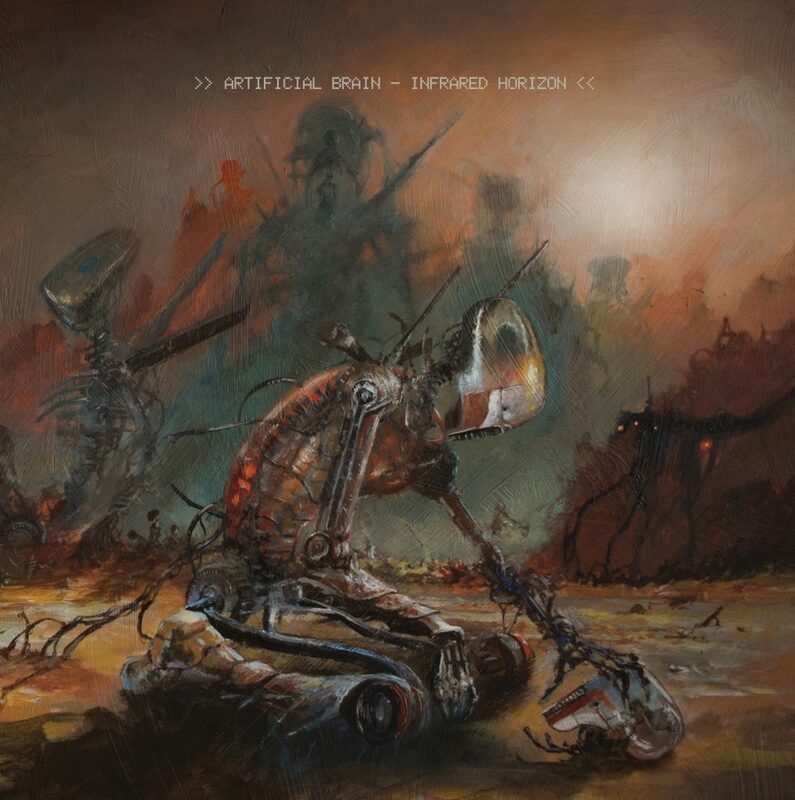 Artificial Brain managed to meet and surpass any and all expectations with ‘Infrared Horizon’, a true successor in every way to their lauded debut album. Successfully improving upon the aforementioned musical styles utilized while continuing to push the limits as to how much sonic chaos and brutality one can combine, the band managed to reach a new plateau their signature sound of galactic discord. Right from the start, guitarist Dan Gargiulo captivates with his signature chord voicing in the incredibly heavy yet progressive sounding album opener. ‘Floating in Delirium’ is a relentless three-and-a-half minute song that takes the listener through a crushing, hypnotic journey through Artificial Brain’s versatile musical canvas before slamming you with ‘Synthesized Instinct’, one of their most dissonant and dizzying songs to date. Most notably in these first two tracks but also throughout the entirety of the album is the musical performance by bassist Samuel Smith, who really shines with his melodic bass lines that creep out and manage to find an audience among all the noise and chaos, adding some much appreciated clarity and bliss. As the album progresses and moves further along, the natural flow from one song to the next becomes more and more apparent. 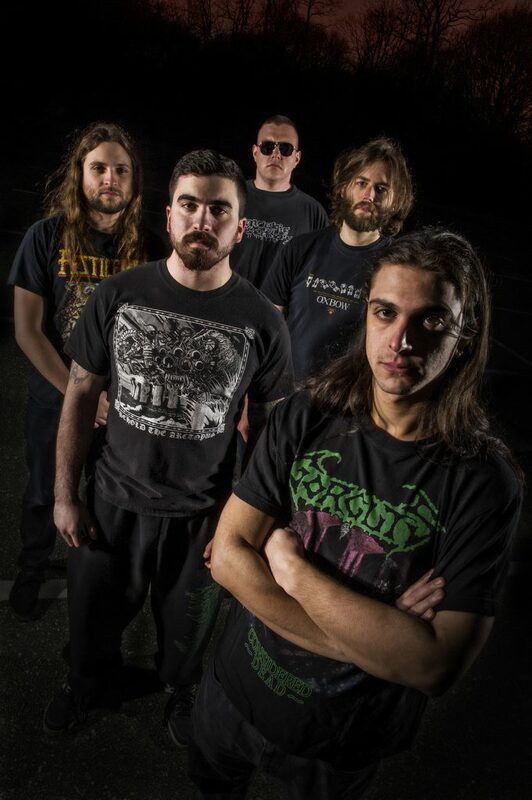 Choosing to have the songs in the order they are in was a conscious decision made by the band and showcases that they every little nuance was thought out, and works to create a full-fledged technical death metal concept album. This becomes more evident towards the middle of the album, starting with the track ‘Estranged from Orbit’, which also serves as a song in which Artificial Brain really begin to showcase their musical progression and matured sound. With smoother transitions from section to section and controlled yet relentless drumming from Keith Abrami, the epic title track ‘Infrared Horizon’ absolutely destroys and is one of the highlights of this record, courtesy of an amazing guitar solo by guitarist Jon Locastro which appears in the middle of the song. The other clear standout of the record that fans will surely agree with is the crushingly brutal and fast track ‘Anchored to the Inlay Arc’. This song truly showcases some of the most diverse vocals that Will Smith has put on record, often straying away from his guttural lows to belt out some impressive highs and unique banshee screams. Because of the abrupt nature of the song, this could have easily been released as a single that would have caught the attention of anyone who listened. ‘Vacant Explorer’ is a great track towards the tail end of the album, a very black metal influenced track that leaves you wanting for more and is as open as its title suggests. A definite headbanger of a song that will translate very well the band plays it live. ‘Graveyard of Lightless Planets’ is the “calmest” song on the album, but whatever it lacks in speed and ferocity it more than makes up for in extremely memorable riffage and excellent composition. Closing out the record and ending just as quickly as the album starts is the final song ‘Ash Eclipse’, a tempo-changing unnatural sounding song which obliterates its way through before finishing. ‘Infrared Horizon’ is everything you’d expect from an Artificial Brain release and more, simply put. From the unique lyrical theme about robots and cyborgs who’ve outlived human beings and see themselves as the perfect form of evolution, to the superb songwriting in each and every song, Artificial Brain have delivered yet again another near-perfect record that continues to carry their signature sound. Not every song stands out amid the frenzy and chaos of the record — something new fans will have to get accustomed to since this is truly in every sense of the word, an extreme metal record — but are no inherently bad or boring tracks. Each one serves its own purpose and shows a new style we haven’t yet heard from this band. From their early 2011 demo to the 2013 EP ‘Butchering Cosmic Giants’ and their universally appraised 2014 debut album ‘Labyrinth Constellation’, Artificial Brain is on the fast track to becoming one of the best and most highly regarded extreme metal acts of recent times. ‘Infrared Horizon’ further cements that assertion. If you live in the LA area, come to one of our Metal Assault Nights at the Viper Room!